A few months back, I bought a new shift knob for my car. It’s a beautiful neo-chrome (which is my new favorite thing) and I love showing it off to my friends. The only problem is that the stock shift boot was substantially lower than the new knob, so it looked a little weird, as you can see in the before/after picture at the bottom of this post. When I couldn’t find the perfect shift boot, I decided it was time for a DIY shift boot! I bought some fabric and pulled my whole car apart and spent my afternoon making a beautiful new shift boot!! This was also the perfect opportunity to thoroughly clean my center console. First, I took the center console out of my car – a 2006 Scion xB named BoxBox – and removed the shift boot. I tore it apart with a seam ripper (which, I must say, was a bit nerve-wracking) and traced it for a start to my pattern. I extended the top a bit so that the new one would be tall enough and made a quick mock-up. Once I was satisfied with that, I traced the pattern onto the backside of the faux leather (wrong, a few times) and cut it out. Then I sewed together the front seam and did some top stitching. I was wondering how I was going to get this top-stitching thing done, considering how small the top of the boot gets. Turns out the stock boot has top stitching all the way up on the front, and only part of the way up on the back. With this new knowledge, I top-stitched the front part before sewing the back seam and I’d say it looks pretty darn good. Nifty! 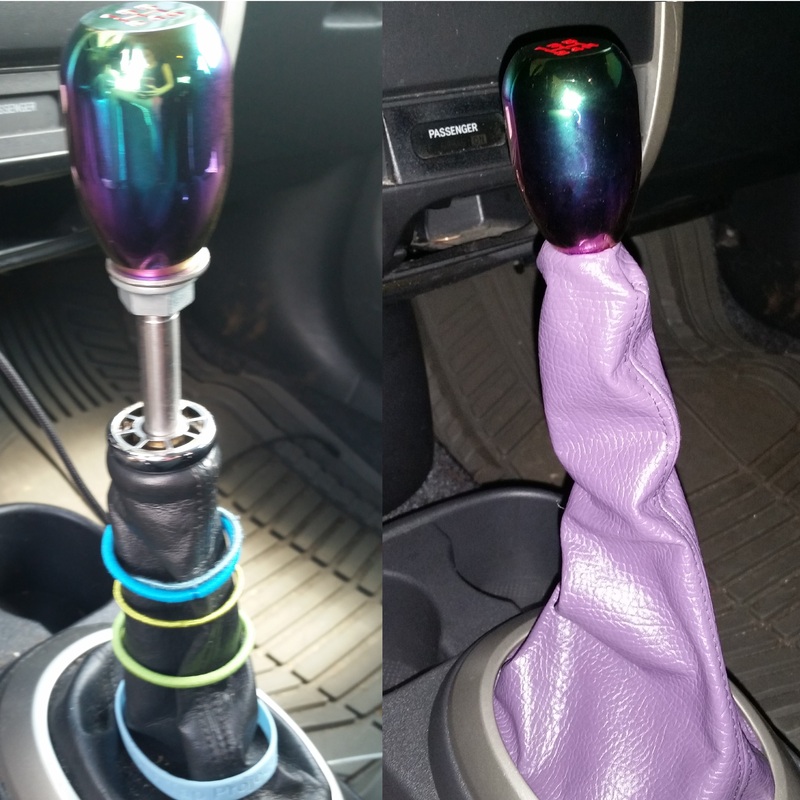 Something to note: If I ever decide to sell my trusty BoxBox, I will likely have to sew up a new shift boot in the classic black (since purple isn’t everyone’s favorite color for some reason) and replace the OEM shift knob (which I’ve kept, just to be safe). That shouldn’t be a problem, but I’m not convinced the one I took off would be thrilled about being sewn back together, so I threw it out, since the 9 years of wear were showing.